Students vocalized their dismay towards a feeling of anti-Palestinian culture within the NYU Law School on Friday. NYU Law students gathered for a silent vigil on Friday to show solidarity with Palestinian citizens in their ongoing struggle with Israel. 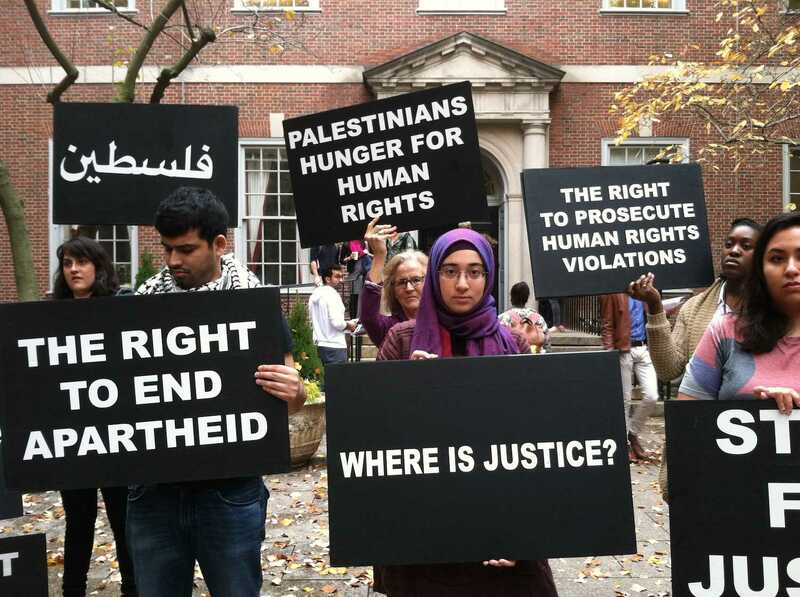 The vigil, held in the NYU Law’s Vanderbilt Courtyard, also aimed to bring attention to Palestinian suffering and the Law School’s alleged pro-Israeli sympathies. Students brought large, black signs, handed out flyers and posed for pictures. The event was sponsored by Law Students for Justice in Palestine, one of NYU Law’s newest student advocacy groups, according to Law student Colinford Mattis. Salmah Rizvi, another NYU Law student, said the demonstration tried to bring attention to the current issues. “Today’s event was prompted by recent activities on Palestinian land, in particular the extrajudicial killings of Palestinian citizens,” Rizvi said. In addition, said Law student Amith Gupta, the effort to raise awareness was further spurred by a series of emails exchanged between law students. Gupta also pointed to NYU Law’s adoption of Thane Rosenbaum’s Forum on Law, Culture & Society in 2014 as evidence of the school’s animosity toward Palestinians. In a July 2014 opinion piece for the Wall Street Journal, Rosenbaum suggested that all citizens of the Gaza Strip could be considered combatants. Rizvi agreed that she felt the presence of a pro-Israeli bias on campus, but saw promise in the student organizations. Gupta also noted pro-Israeli sentiment on campus and suggested that it occasionally veered into hostility. Mattis also said organizations like LSJP could have positive effects on community discourse. It’s nice to know NYU’s journalism school honors press freedoms. Freedom of the press (and speech) was intended to protect the rights of those with dissenting opinions. No entity needs to protect the rights of those voicing the popular viewpoint. Evidently NYU’s editorial board believes their mission is to delete the dissenting opinion, that of arguing why this Palestinian charade is dishonest and morally bankrupt. Congratulations NYU’s editorial board for turning your back on the First Amendment and for dishonoring the journalist’s most important role – that of honoring individuals the right to voice the contrary opinion.